Here is something remarkably different from the norm. A review of a food item that was sent to me to try out. The tech/gadget angle? Well, they are microwaveable. The ‘me’ angle? I am from Pakistan, love naans, and love all sorts of food, so can often be a harsh critic. So, what are these then? Wraps with curries inside. 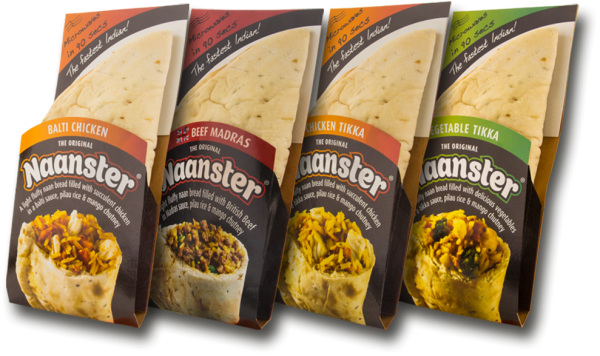 And yes, I am pretty sure the name Naanster is stolen from Ginsters. Well, I guess the concept of a wrap is nothing new. The concept of wrapping up a curry in a chapati/paratha is nothing new either. In fact, you can find lots of places selling ‘paratha rolls’ all over the world. Everybody has also had stuffed naans, which offer flavours such as cheese, minced meat, and many others, such as Peshwari naan. What makes them different? The fact that they have mixed rice in there. When I microwaved it for the first time, I was expecting a wrap with the oils of the curry seeping through, too hot on the inside, and a bit dry on the outside. I mean, that is what happens to most wraps, right? Well, I was pleasantly surprised. The wraps ‘survive’ the microwave process fairly well, and after leaving it for a minute, it is perfectly well suited to be eaten. The addition of rice gives a perfect balance to the flavours, and the flavours do come across a good. While the flavours differ, there is the common element of the vegetables, pulao rice and the mango chutney. That does give everything a very similar flavour, which is something that doesn’t sit very well for these, but it doesn’t differ too much from your average curry house in Britain. What do others think? Well, I shared some with my colleagues, and one of them put this one perfectly. He said it was like a samosa, but without the deep frying oiliness. So, how well do I rate it? I think it is perfectly good option for lunch. One is good, and two fill me up quite nicely, but I would easily eat two in one lunch time sitting. Dinner, it just won’t do for, unless it is thrown in as an extra snack. They are available at various retailers around UK.